A Happy New Year to all, hoping it brings health, happiness and all you wish for. As you will have noted following an email from President Kim, we do not have Assembly this coming Monday, but instead a social evening at the Inter Club at our usual time. Treasurer, Peter reports a profit of $563.88 from the Ham Wheel. Many thanks to all who helped sell the tickets. 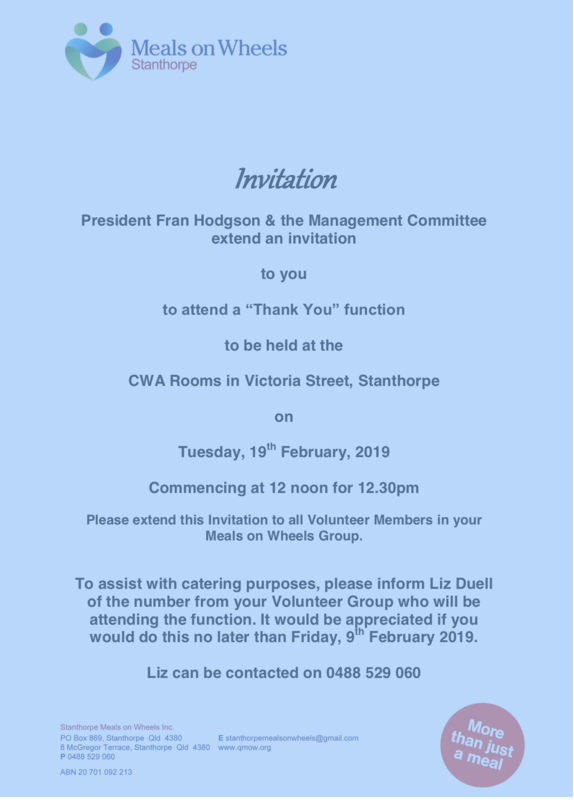 Julie has sent the invitation below to all Meals on Wheels helpers. Melissa has sent Newsletters from the worthy Rotary organisation, Interplast, ROMAC and Disaster Aid. Anyone interested in reading these newsletters can let me know and I can froward links or alternatively read all about their activities on the appropriate websites. Thanks to all the Rotarians who assisted the Salvos with their Christmas Eve Dinner for those of our community needing a dose of Christmas spirit. Well done all who helped, for waving the Rotary flag and showing we care. Weekly giggle....... What is grey, has four legs and a trunk? A mouse going on holidays.